Weathering is the process that breaks down rock and other substances at Earth’s surface.Repeated freezing and thawing, for example, can crack rock apart into smaller pieces. Rainwater can dissolve minerals that bind rock together.The forces of weathering break rocks into smaller and smaller pieces. Then the forces of erosion carry the pieces away. Erosion (ee roh zhun) is the removal of rock particles by wind, water, ice, or gravity. Weathering and erosion work together continuously to wear down and carry away the rocks at Earth’s surface. What Is Soil? The crack in the rock seems to have little in common with a flower garden containing thick, rich soil. But soil is what the weathered rock and other materials in the crack have started to become. Soil is the loose, weathered material on Earth’s surface in which plants can grow. One of the main ingredients of soil comes from bedrock. Bedrock is the solid layer of rock beneath the soil. Once exposed at the surface, bedrock gradually weathers into smaller and smaller particles that are the basic material of soil. Soil Composition: Soil is more than just particles of weathered bedrock. Soil is a mixture of rock particles, minerals, decayed organic material, water, and air. Together, sand, silt, and clay make up the portion of soil that comes from weathered rock. The decayed organic material in soil is called humus. Humus (hyoo mus) is a dark-colored substance that forms as plant and animal remains decay. Sand feels coarse and grainy, but clay feels smooth and silky. These differences are differences in texture. Soil texture depends on the size of individual soil particles. The particles of rock in soil are classified by size. The largest soil particles are gravel. 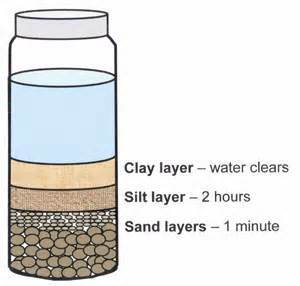 The smallest soil particles are clay. Clay particles are smaller than the period at the end of this sentence. Soil texture is important for plant growth. Soil that is mostly clay has a dense, heavy texture. Some clay soils hold a lot of water, so plants grown in them may “drown” for lack of air. In contrast, sandy soil has a coarse texture. Water quickly drains through it, so plants may die for lack of water. Soil that is made up of about equal parts of clay, sand, and silt is called loam. It has a crumbly texture that holds both air and water. Loam is best for growing most types of plants.Soil forms as rock is broken down by weathering and mixes with other materials on the surface. Soil is constantly being formed wherever bedrock is exposed. Soil formation continues over a long period of time. Gradually, soil develops layers called horizons. The A horizon is made up of topsoil, a crumbly, dark brown soil that is a mixture of humus, clay, and other minerals. The B horizon, often called subsoil, usually consists of clay and other particles washed down from the A horizon, but little humus. If you look closely at soil, you can see that it is teeming with living things. Some soil organisms make humus, the material that makes soil fertile. Other soil organisms mix the soil and make spaces in it for air and water. Plants contribute most of the organic remains that form humus. As plants shed leaves, they form a loose layer called litter. When plants die, their remains fall to the ground and become part of the litter. Plant roots also die and begin to decay underground. Although plant remains are full of stored nutrients, they are not yet humus. Humus forms in a process called decomposition. During decomposition, organisms that live in soil turn dead organic material into humus. These organisms are called decomposers. Decomposers are the organisms that break the remains of dead organisms into smaller pieces and digest them with chemicals. Soil decomposers include fungi, bacteria, worms, and other organisms. Fungi are organisms such as molds and mushrooms. Fungi grow on, and digest, plant remains. Bacteria are microscopic decomposers that cause decay. Bacteria attack dead organisms and their wastes in soil. Very small animals, such as mites and worms, also decompose dead organic material and mix it with the soil. Earthworms do most of the work of mixing humus with other materials in soil. As earthworms eat their way through the soil, they carry humus down to the subsoil and subsoil up to the surface. Earthworms also pass out the soil they eat as waste. The waste soil is enriched with substances that plants need to grow, such as nitrogen. Many burrowing mammals such as mice, moles, prairie dogs, and gophers break up hard, compacted soil and mix humus through it. These animals also add nitrogen to the soil when they produce waste. They add organic material when they die and decay. Earthworms and burrowing animals also help to aerate, or mix air into, the soil. Plant roots need the oxygen that this process adds to the soil.